Auchentoshan is a Lowlands Distillery near Glasgow, Scotland. They produce an impressive lineup of not-so-classic Single Malt Whiskys, dubbing their movement the "New Malt Order". Today I'm featuring their Three Wood, which as the name suggests is finished in 3 different types of casks. Each wood imparting its unique flavor profile on the finished product. Bourbon, Spanish Oloroso, and Pedro Ximenez Sherry casks bring color, flavor, and complexity to this smooth-sippin juice. Let's talk specs- coming in at 86 proof, this 100% malted barley starts its life in a lauter tun, and sits in Oregon Pine (as opposed to stainless steel) before distillation. An exception to most Scotches, this brew is triple distilled, refining the grain characteristic, and giving a smooth finish and mouthfeel. If a spirit wants to be called Single Malt Scotch Whisky, it must be matured in oak for at least three years - no less. We go much further. Our whisky is matured in casks which held bourbon, sherry or fine wine. A selfless act of recycling? Not quite. It's an essential step in creating Auchentoshan - the spirit and the wood work together over many years, lending colour and flavour to the finished whisky. So it's no surprise we spend so much time and effort selecting precisely the right casks - or indeed in balancing the unique flavours each cask imparts. That way, we create a whisky with flavours right across the spectrum. The day to day of being in the bar industry is hard work. Long hours on your feet, constant pressure to be social and peppy, and making the same drinks over and over again. Bar Institute provided a three day oasis, surrounded by extremely passionate people, to restore your lust for liquids. Balancing classes, events, and logistics can't be easy for the production team, I wanna take a minute to thank them for putting on such a marvelous event! This year's Bar Institute, formerly Portland Cocktail Week, was produced by Lush Life Productions, whose founder and CEO Lindsey Johnson was recently featured in Wine Enthusiast's TOP 40 UNDER 40 Tastemakers. The most involved educators I experienced were Proprietors LLC of Death & Co. Alex Day, David Kaplan, and Devon Tarby. Here is a chronological order of events as I experienced them, I didn't attend every event, but definitely enjoyed every bit of what I experienced! The best part of it all was running into industry friends from PDX, San Francisco, and Seattle. I also got to make so many new friends! Registration for B.I. 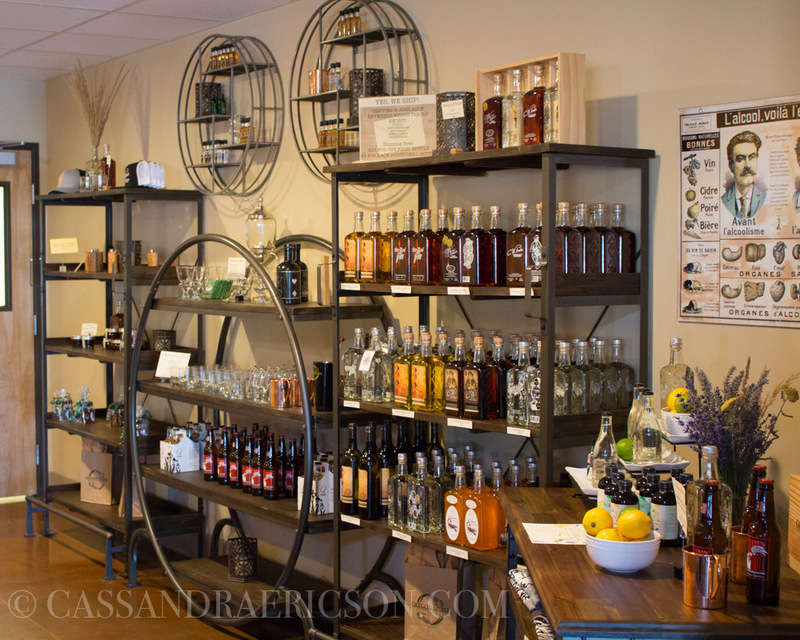 started at House Spirits Distillery, where attendees were met with the cutest bottled Southside cocktails featuring Aviation Gin. Tasty sliders and malted chips were enjoyed and tours of the distillery were circulating through the facility. Hopped on a limo bus to the next event- The Bon Vivants Swig & Swine fundraiser benefiting a local Charter school. Barrels full of Goonies-themed cocktails lined up in the shade, while some of Portland's top chefs delivered excellent porcine fare. Some memorable nibbles: Thinly sliced lardo, luxardo spiked gelato, pulled pork on wonder bread, and juicy brisket. After the swig and swine event, I ubered over to Tournant for the pop-up farm-to-table dinner event. Each course was expertly presented to contrast how raw and cooked versions of the same vegetable change in flavor profiles. 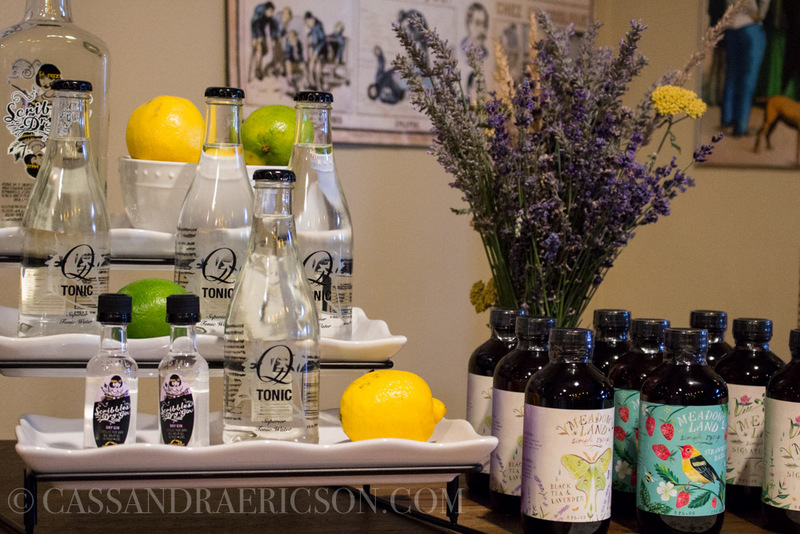 Also with each course, guests were served with a "base" cocktail" that was modified using the mise en place on the tables. Saline drops, lemon and orange peels, as well as amaro and vermouth, were dashed and splashed to customize the cocktails as we pleased, taking notes of the building of flavors with each variation. Party bus arrives to Tournant to whisk us away to the Woodford Reserve tasting, which had food and whiskey stations. Woodford paired with salmon tartare, Woodford Double Oaked paired with chocolate, and the ping pong table was a really fun addition to the event! Transportation was provided to the mash-ups, which included Multnomah Whiskey Library, Kask, Hamlet, and Clyde Common. For those who survived the mash-ups, classes began at 10am Monday (which is early by bartender standards). Between classes, there were Americanized tacos, cinnamon churros, Red Bull, and liquor to keep everyone fueled for the day. Following classes, Herradura Tequila hosted an event at Leftbank Annex, where we used headphones for a tasting of 3 types of Herradura. Giant metallic agave plants adorned the room, which reminded me of the Walking Dead security spikes. Don't trip and fall, or you might impale yourself. Ha. Late night we made our way to Bithouse Saloon for the Jagermeister Dinner. Each room had a different course paired with a cocktail. My favorite plates: Ceviche, fried chicken with molasses, and pork belly blinis. The tastiest cocktail for me was the frozen mocha cocktail served from a slushy machine which felt like a dessert. By day 3 a lot of people were worn out! I saw people sleeping in class, bags under the eyes forming, but go big or go home! Day 3 included one of my favorite classes of the week, Cocktail Development, and Progressive Bar Business Models. In the Cocktail Development Workshop (which coincidentally couldn't have alcohol in the room because of good ole OLCC regulations) we tasted the differences between lemon juice and citric acid in grapefruit, and talked about the balance of drinks with proof. So useful! For dinner, we were shuttled to Taqueria Nueve for tacos and Elote (corn) and mezcal.... so much mezcal! Finally at the Museum of Contemporary Art, Auchentoshan Single Malt Scotch hosted an interactive event with Postcard making and silk-screening. What fun to have DIY made souvenirs and swag. We also got to taste an array of products and cocktails using Auchentoshan. Blue Star donuts paired with scotch ain't half bad! I missed out on the Patron Karaoke contest afterwards, but as you could imagine after 3 days of eating and drinking, my bed sounded pretty damn good. When in Bend... oh lordy, when in Bend... seek out all the makers, bakers, and shakers! 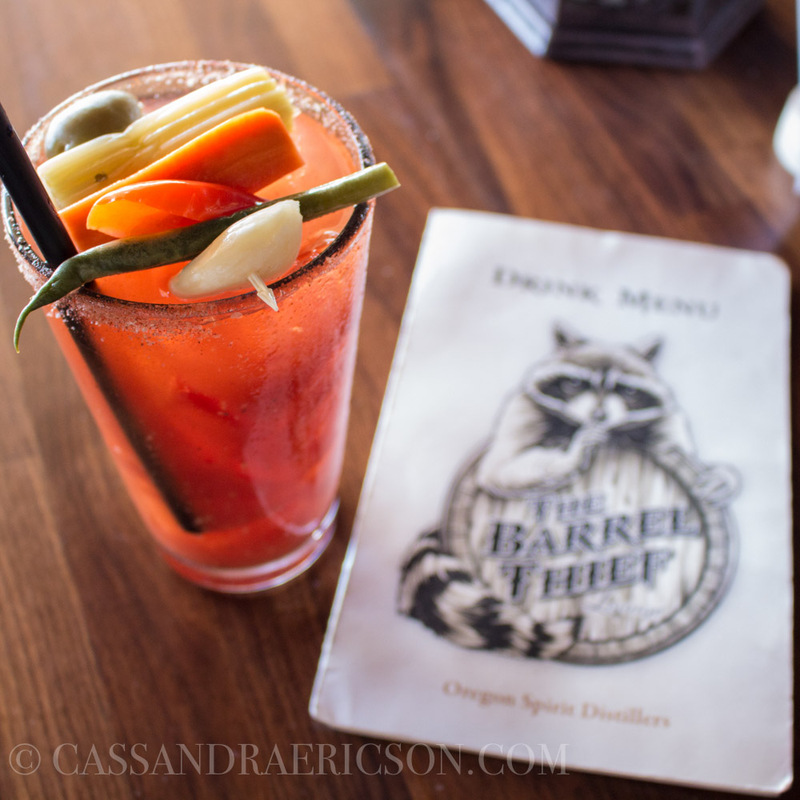 If you visit Bend, the food & beverage selections will NOT disappoint. After an already long weekend of drinking and merry-making with my good friend Maia, her colleagues invited us out for a recovery brunch, followed by (you guessed it!) more booze. This was the most memorable stop of my weekend, and hair of the dog yadda yadda (ie: AMAZING BLOODY MARY PICTURED BELOW) saved my life. Check. it. out. The pickled garlic was ahhhhh-mazing. 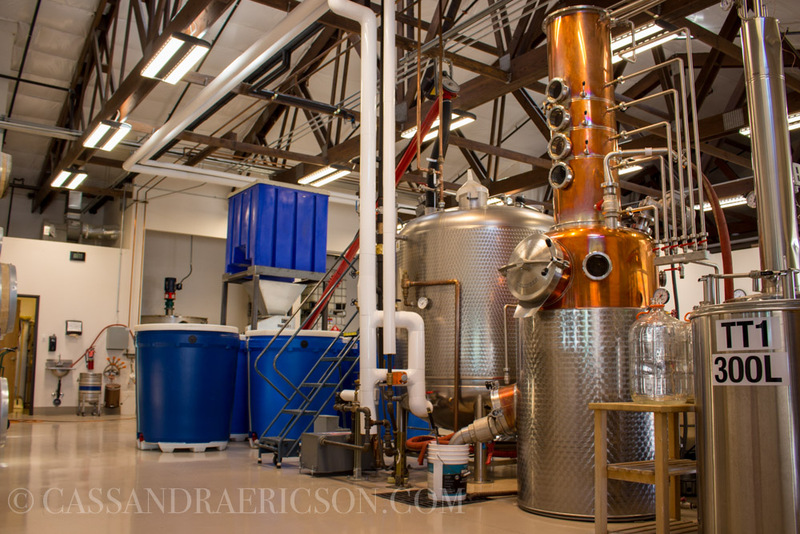 "To distill with a commitment to local agriculture and Oregon’s bold independent personality. To bring quality, premium spirit brands which are unique, interesting and outstanding in their class to the world market." Their products are Oregonian as possible, and the team puts an emphasis on learning. They even use the term "Spirit Geeks"! That is a term I can get behind! A visit here is a completely spiritual experience. Have a taste, tour, then relax with a cocktail on their patio. I noticed they had huge fire pits outside, but as it was 90 degrees out, weren't necessary. They also have an "Adopt a barrel" program if you'd like to buy a nice gift for yourself or someone special. 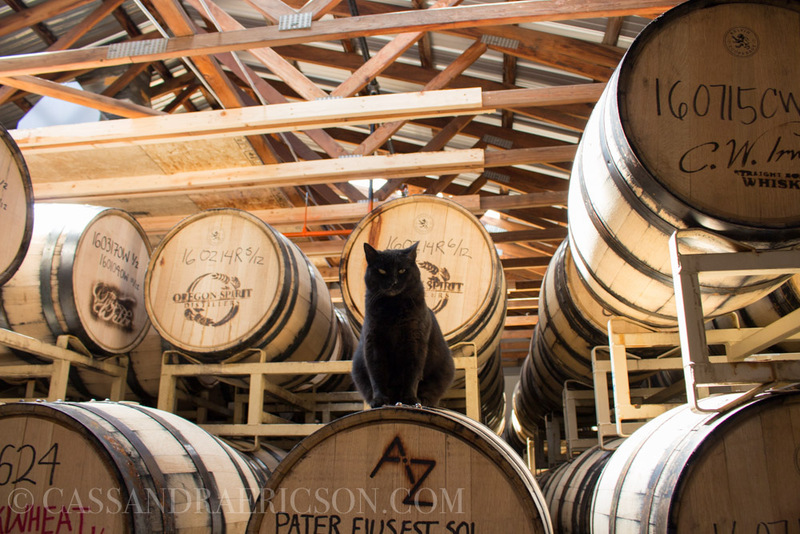 You can buy a barrel for your bar, and you can even request a specific proof for your spirit!